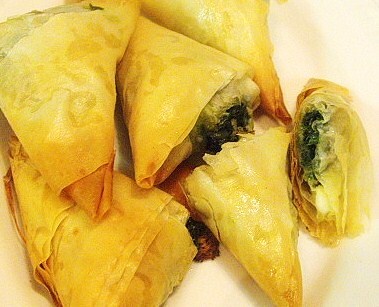 These individual Greek spinach pies are easy to prepare and they make great appetizers. I served them with Greek Beef Stew over Minted Orzo with Baklava for dessert. Mmmm! No problem getting these fellas to eat spinach that day, I assure you, and requests have made for round two from my youngest. Heat oven to 350 degrees. Generously grease a baking sheet with melted butter. Heat oil in a large saute pan over medium to high heat. Saute garlic until translucent and toss in baby spinach. Cook until wilted. Cool. Season with salt, pepper, and nutmeg. Stir in cheese. 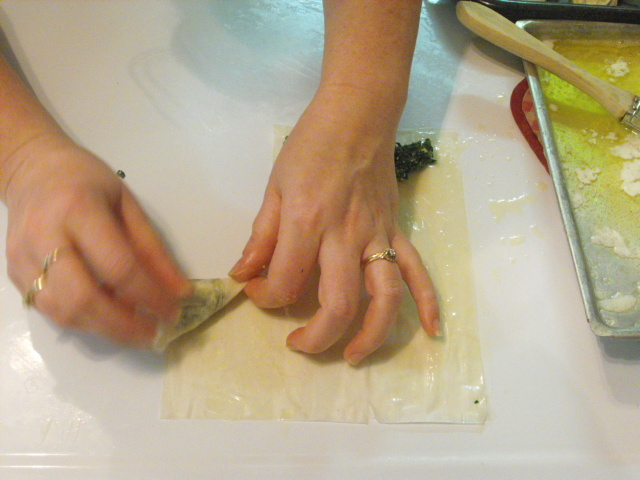 Lay out one sheet of phyllo and brush with melted butter. Repeat. Cut horizontally into six even strips. 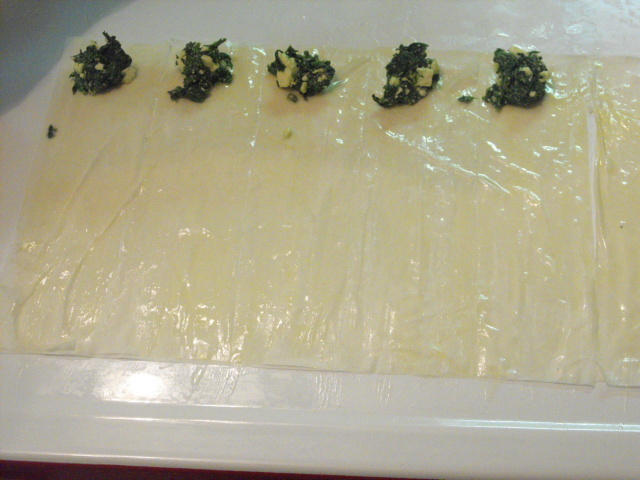 Drop one rounded teaspoon of the spinach mixture at the top end of each strip. Fold over to form a triangle. 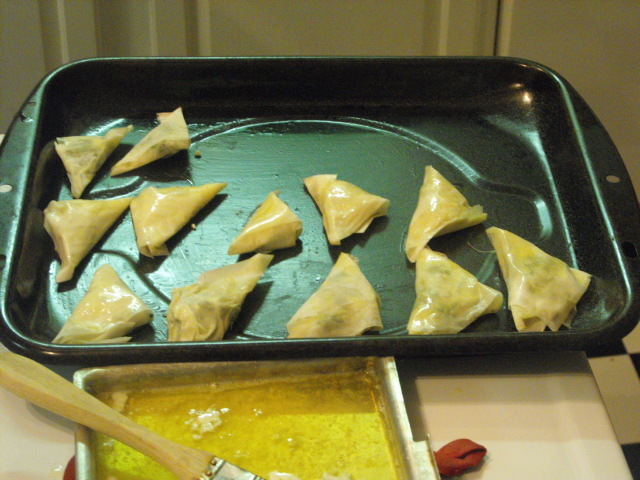 Fold again to opposite corner to form another triangle, as if you were folding a flag, until you reach the end of the phyllo strip. Repeat until all of the spinach is used. 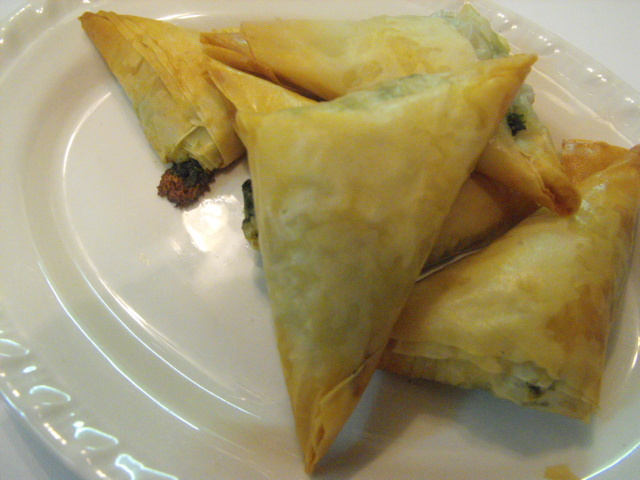 Brush phyllo triangles with butter and bake until golden brown, 10 to 15 minutes. Wow-I love the look of those. They look so easy.